Martin Donohoe “Artist in Residence” in St. Louis Infant school had his first meeting with school principal Mrs Mc Carroll and Mrs Greenan on Wednesday 28th November. This marked the beginning of what was to be a 6 week partnership of musical learning, activities and lots of fun for all in our school. 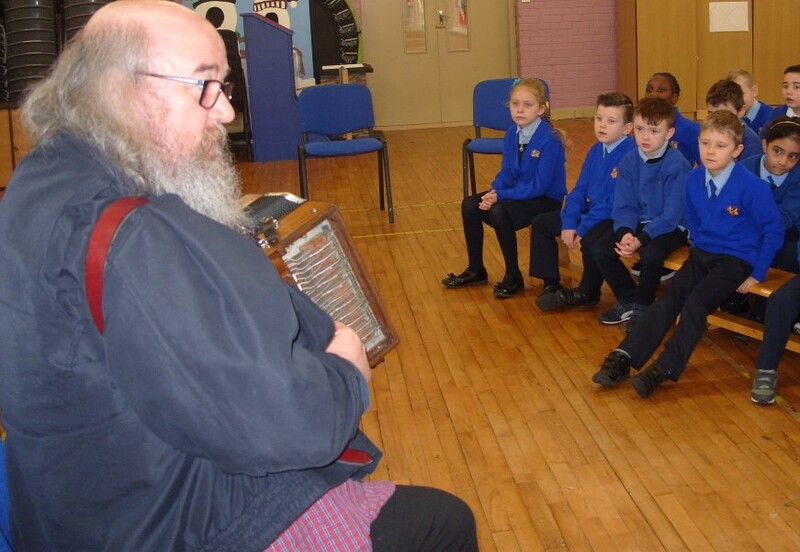 This scheme is a wonderful opportunity for the children in our school not just to listen to live music but to work with and be tutored by a musician. It provides an opportunity also to the teachers to partner with a professional performer. Our theme is “music for all” which is a very apt title for our school. Our aim is that every child should have the opportunity to explore, to listen, to take part in singing, clap rhythms and perform in a fun way. Martin is a well known and talented musician, well known for his involvement with Comhaltas , Fleadh Cheoil na h-Éireann, and “Nyah ”,his very own traditional group. His genuine love and passion for all things musical was apparent as he talked about himself and his family, his” Nyah” and his many friends across the music scene. Martin loves traditional Irish music. It is a “living tradition” to which he is totally committed. He loved working with us in our school as he understands the value of musical education for every child. Talent is not determined by social class. Indeed the Irish traditions of the Céile in the kitchen is evidence of that. In the past skills were learned and handed on without any formal tuition.